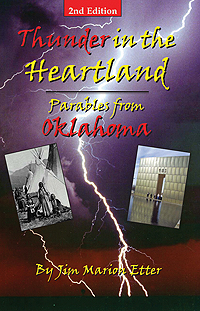 This unique book of fiction, with a foreword by actor Dale Robertson, breathes life into many of Oklahoma’s fascinating facts. Stories inspired by incidents ranging in time from the 1860s to the 1990s awaken countless memories, and portray the Sooner State in its own beauty, ugliness and humor. The Chapters refer to such real people as Millie Durgan (Sain-toh-oodie or Mrs. Goombi), who was raised among the Kiowas; the Cook gang of Indian Territory outlaws; "Pretty Boy" Floyd; and "Pistol Pete"; and actual incidents and traditions like the major cattle trails; a memorable shooting in the Panhandle; the Quadruple lynching in an Ada livery barn; the 1978 fatal shoot-out between Oklahoma Highway Patrolmen and prison escapees; the days of traveling horse traders and outdoor picture shows; the humorous background of the annual Sucker Day in Wetumka; and the terrible day of April 19, 1995, in Oklahoma City. ". . . . in these pages are Jim Etter’s Oklahomans, lovable and unlovable as they are realistically portrayed." - R. C. House, past president, Western Writers of America. "Every Story has a dab of true history, and a whole lot of flovor." – Dale Robertson, actor and screenwriter. Jim Marion Etter is a retired, award-winning reporter for The Daily Oklahoman whose offbeat, folksy writing about his home state has earned him the reputation as "Oklahoma’s master country storyteller." A writer of both fiction and nonfiction, he’s the author of five books and a contributing author of four others, and has written for numerous magazines including Persimmon Hill and Western Horsemen. A native of the small Muskogee County town of Oktaha, he now lives in Oklahoma City. He’s also been a newspaper and television reporter in Laredo, Texas – "El Charro Flaco" – and has served as a military journalist and translator in Latin America.